Slightly smaller than Earth's Moon, Europa’s water-ice surface is crisscrossed by long, linear fractures. Like our planet, Europa is thought to have an iron core, a rocky mantle and an ocean of salty water. Unlike Earth, however, Europa’s ocean lies below a shell of ice probably 10 to 15 miles (15 to 25 kilometers) thick and has an estimated depth of 40 to 100 miles (60 to 150 kilometers). Europa is named for a woman abducted by the god Zeus in Greek mythology–Jupiter to the Romans. Scientists will begin studying Europa anew with the Europa Clipper mission. Scheduled to launch in the 2020s, Europa Clipper would arrive at Jupiter several years later and try to see whether the icy moon could harbor conditions suitable for life. The radiation-tolerant spacecraft will perform 45 flybys of Europa at altitudes varying from 1,675 miles to 16 miles (2,700 kilometers to 25 kilometers) from a long, looping orbit around Jupiter. 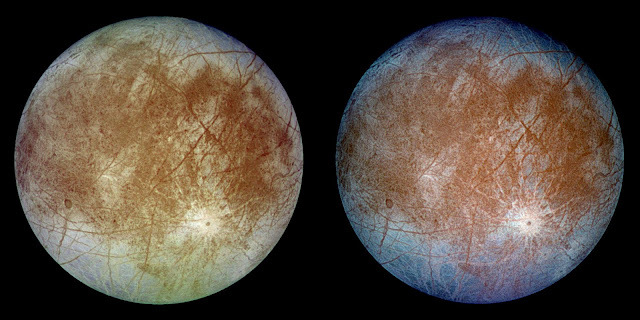 Clipper’s instruments will include cameras and spectrometers to produce high-resolution images of Europa's surface and determine its composition. An ice-penetrating radar will determine the thickness of the moon's icy shell and search for subsurface lakes similar to those beneath Antarctica. The mission will also carry a magnetometer to measure strength and direction of the moon's magnetic field, which will allow scientists to determine the depth and salinity of its ocean. Europa is named for the daughter of Agenor, in ancient Greek mythology. Europa was abducted by Zeus (the Greek equivalent of the Roman god Jupiter), who had taken the shape of a spotless white bull. Europa was so delighted by the gentle beast that she decked it with flowers and rode upon its back. Seizing his opportunity, Zeus rode away with her into the ocean to the island of Crete, where he transformed back into his true shape. Europa bore Zeus many children, including Minos.